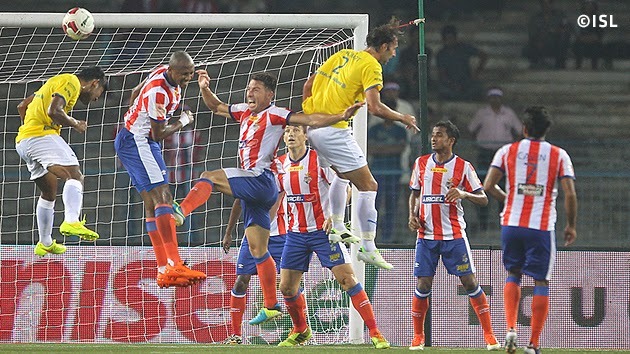 Kerala Blasters FC got their first point of the Hero Indian Super League after coming from behind to earn a hard-fought draw against league leaders Atlético de Kolkata. In a pulsating encounter at Kolkata’s Salt Lake Stadium, both sides would feel they could have taken all three points, with good chances at either end in the second half.The game got off to a lively start, as Kolkata took advantage of their raucous home support and put Kerala on the back foot. Their breakthrough came in the 22nd minute, when Jofre ran down the left wing and put a delightful low ball into the box. Borja Fernández scuffed the chance but managed to keep control and set up Baljit Sahni for a superb finish through two Kerala defenders and past David James to give his side the lead.